On April 20, CNIC organized a seminar with guest speaker Prof. Frank von Hippel, a nuclear physicist from Princeton University’s Program on Science and Global Security, presenting alternative ways to dispose of spent fuel instead of reprocessing, as well as options for disposal of separated plutonium. After this presentation of technical solutions, a panel discussion took place. Prof. Eiji Oguma, a historical sociologist from Keio University’s Faculty of Policy Management and a well-known commentator on the post-Fukushima anti-nuclear movement in Japan, pointed out the political barriers that must be overcome if any of these technical solutions were to be actually implemented, no matter how much more reasonable they may seem from economic and safety perspectives. 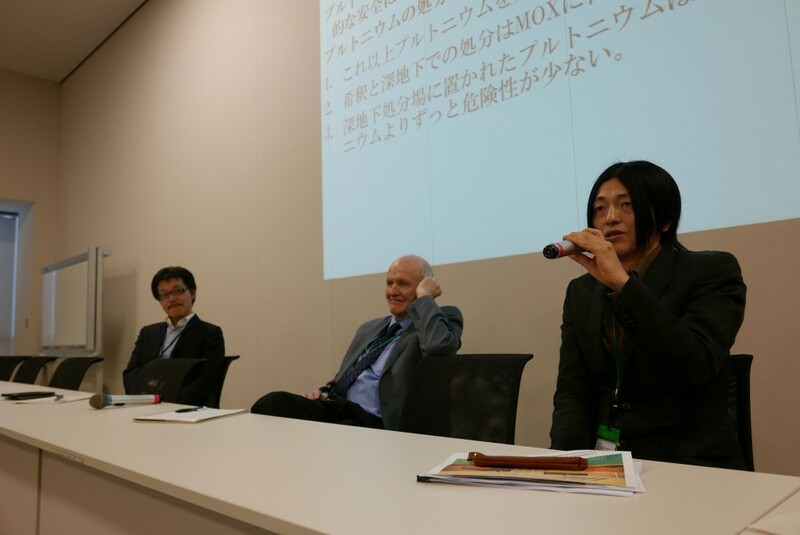 CNIC’s General Secretary, Hajime Matsukubo was also on the panel and brought into the discussion the international implications of Japan’s plutonium policy including the US-Japan Nuclear Agreement. Prof. von Hippel explained that plutonium disposal is a global problem, with more than half of the existent separated plutonium being produced as a result of civilian reprocessing, the rest produced for military purposes. Disposing of the plutonium that had been produced for weapons during the cold war has been a huge headache for the United States with planned disposal by burning it as MOX fuel in commercial reactors proving hugely expensive. America has all but abandoned its half-built MOX plant and is now looking towards the ‘dilute and dispose’ option. This process would use glove boxes to mix 300 grams of plutonium oxide into a can of ‘star dust’ (a secret ingredient from which plutonium would be difficult to separate again). This can would then be placed in a plastic bag and another ‘outer blend can.’ Another way of immobilizing plutonium is the Hot Isostatic Pressing method, which is being developed in the UK and utilizes radiation-resistant, low-solubility ceramic. After plutonium has been immobilized, it is safer to bury it underground than keep it on the surface and Prof. von Hippel mentioned the deep borehole disposal method which uses techniques developed for drilling oil and geothermal wells that can bore five kilometers into the earth. In the US, however, plans for a demonstration project of this method of radioactive waste disposal were rejected by local governments. Prof. von Hippel stressed that the main lesson for Japan is that separated plutonium is extremely difficult to dispose of and that it is definitely better not to separate any more than is already stockpiled. Instead of sending spent fuel from the nation’s nuclear power plants to Rokkasho for reprocessing, it would be safer and much cheaper and more efficient to set up dry cask storage for the spent fuel onsite at the plant. Prof. von Hippel showed us successful examples of this method in the US and suggested that there were moves in this direction in Japan as well.